Apparently, I had a brain fart last week!!! I didn't realize that this never posted. 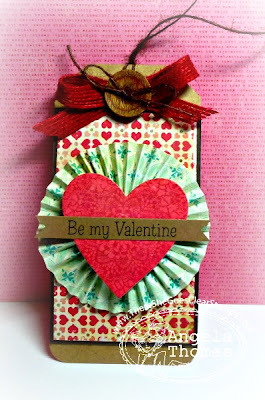 I made this tag for last week's TSG Inspiration challenge. I was in the mood to make a tag, so that's what I did. So there... LOL. For my tag, I created a rosette in the blue-ish colored DP. I then added a heart that I made using the Hearts dienamic from MFT. The sentiment comes from the new TSG set called "Be My Valentine" which was stamped in Archival Black Ink. It's TSGA again week where we highlight some of our older sets so you'll see me pretty busy on my blog this week! !